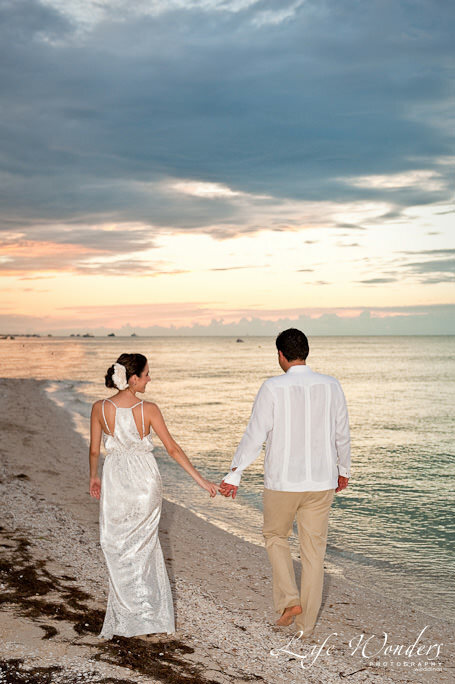 Not sure what kind of beach wedding dress to wear for your Mexico wedding celebration? 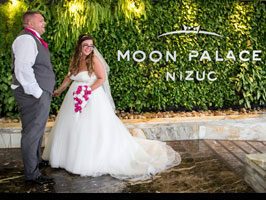 If it is a beach wedding, you will be dealing with the sand, sun, and surf on your wedding day, so I would recommend you opt for a more simple beach wedding dress — you do not want to be weighed down by or sweating through a dress that’s just not appropriate for your incredible destination wedding location. 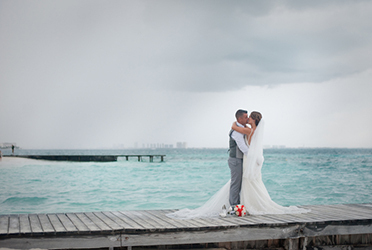 When it comes to beach weddings, I’ve seen that ball gowns with full, crinoline skirts are better left in ballrooms. 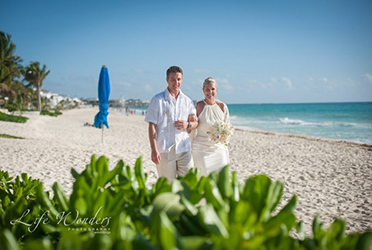 For Riviera Maya weddings, simple beach wedding dresses are the best option because they are lightweight and easy to care for (this will also make it easier to transport the dress to your destination wedding). 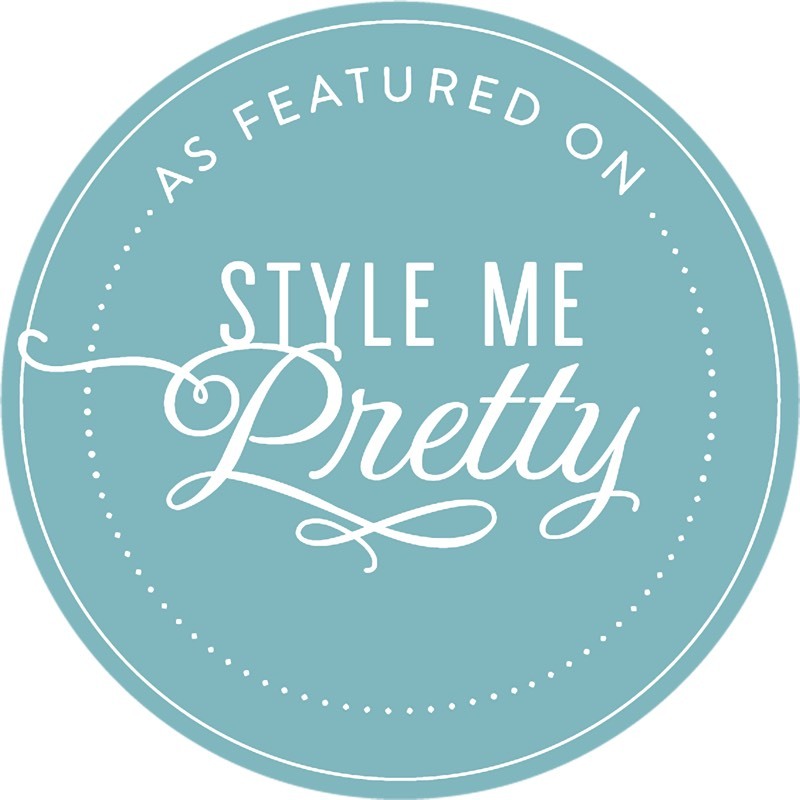 Consider lighter yet still elegant fabrics like organza, chiffon, cotton eyelet, or crepe. Stay away from satin, which is not only heavy, it’s also a fabric that’s just not very breathable, either. 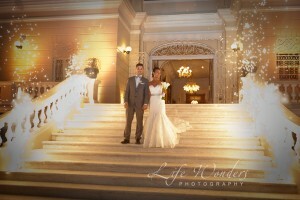 If you love the intricate look for wedding dresses, opt for a beautiful design with a lace overlay, instead of beading. With lace, you’ll get to enjoy a subtle, hand-stitched design without being weighed down by thousands of beads or sequins. The other thing that shouldn’t be too heavy? Your make up; stick to light layers of make up for a breathable, beach-y look. 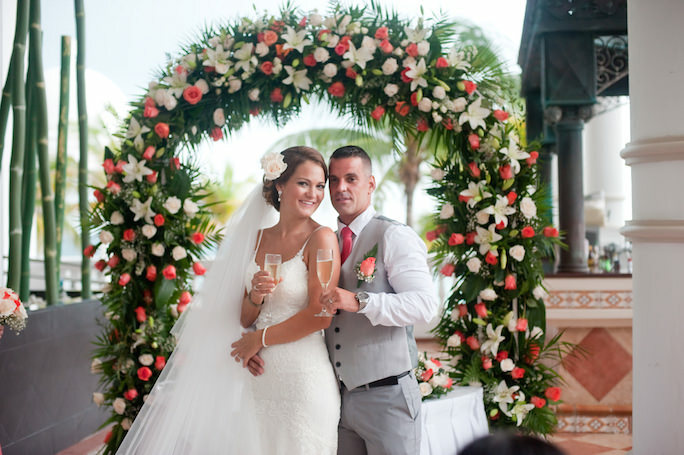 Click here to read my article for more beach wedding makeup tips. 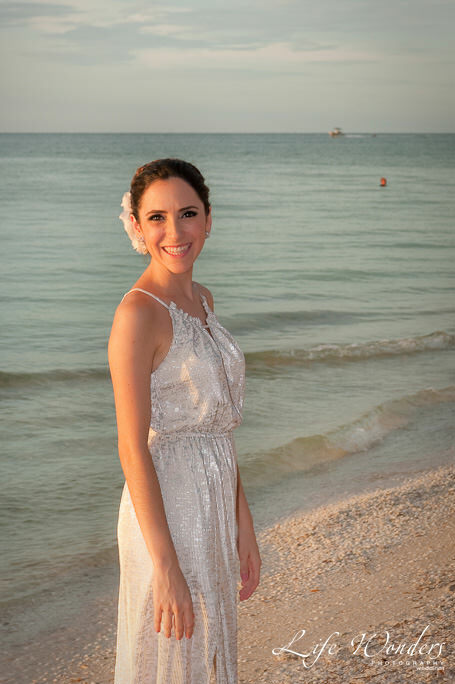 I photographed Dana, a beautiful bride, on her big day wearing a stunning lace gown, which wasn’t too heavy — perfect for a Cancun beach wedding. 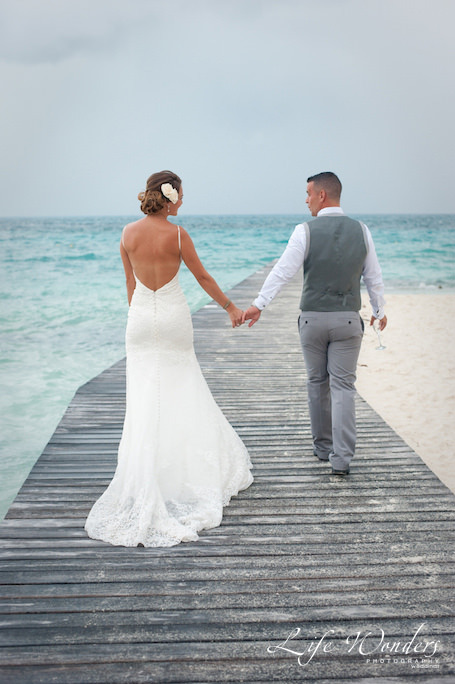 For a beach wedding, you don’t just want to think about what your dress is made of, but how it’s cut. Even a wedding dress made of the lightest fabric will be uncomfortable if it’s cut too close to the body. 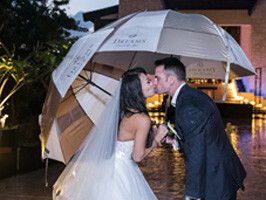 The best beach wedding dresses are cut a little bit looser for better air circulation, allowing the bride to stay cool under the hot sun and take advantage of refreshing ocean breezes. Flow-y A-line dresses are always a great pick, as are Grecian styles and simple column dresses. 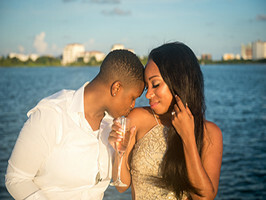 If you’re looking for a beach wedding dress with more visual interest, consider casual wedding dresses with chicly placed cutouts or criss-crossing straps; dresses with low backs and largely bare shoulders are perfect for beach weddings. 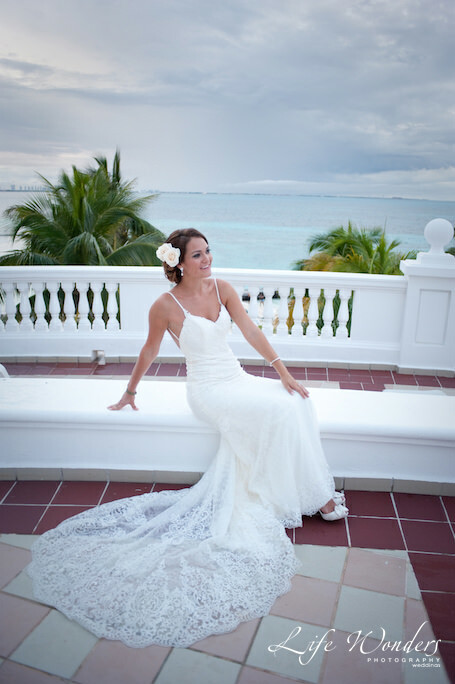 Caludina’s stunning gown is a perfect example of a looser style of beach wedding dress, cinched simply at the waist. Many bridesmaid dresses are already beach-appropriate, since they’re often knee length instead of floor length. 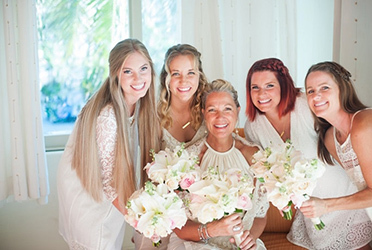 But to really make your bridesmaids shine during your beach wedding, look for styles that include lots of ruffles or light layers — these kinds of dresses look beautiful when a warm ocean breeze lightly tosses the fabric. Plus, short, flow-y layers will help keep your bridesmaids cool. 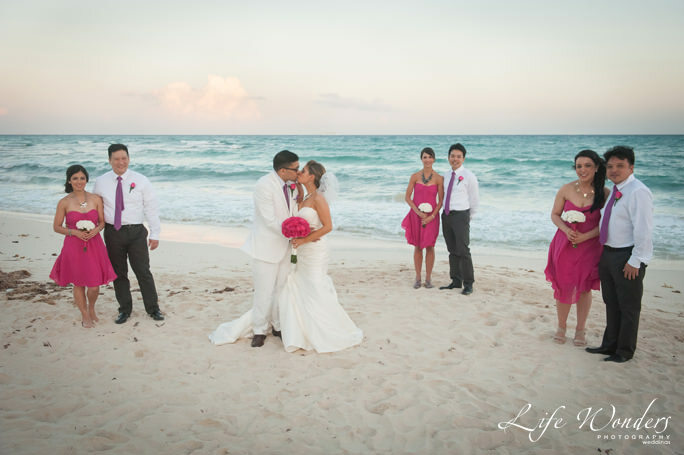 Don’t forget to consider the best colors for your beach bridesmaid dresses. Bright, tropical hues like coral and aqua really “pop” against the sand and water on the beach, so cladding your bridesmaids in these kinds of colors will make for some amazing bridal party photos. 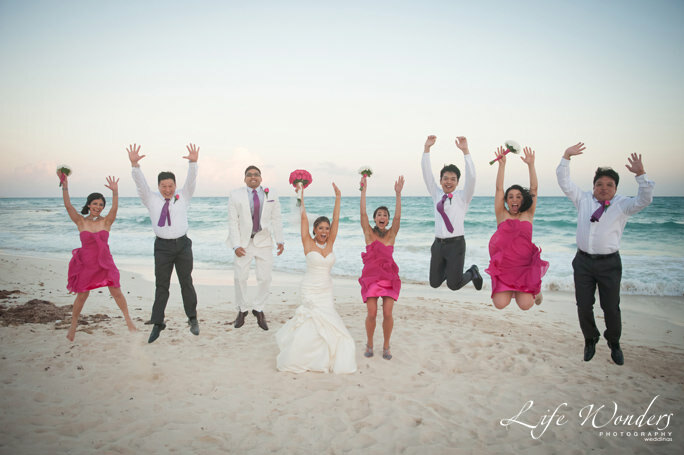 Angelica’s bridesmaids looked stunning — and comfortable — in bright, knee-length dresses made with flow-y fabric. And don’t forget about the groom! 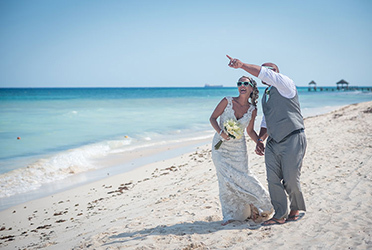 For tips on how to keep your groom both stylish and comfy on your big day, read my article, Mexico Beach Wedding Attire — How to Keep Him Happy. 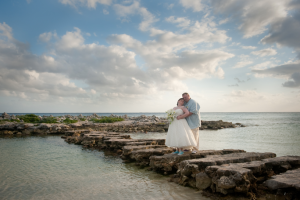 I hope this guide helps you find that perfect beach wedding dress that will help you look and feel your best all evening long…and I will photograph your lovely dress so you can enjoy it for the rest of your life.